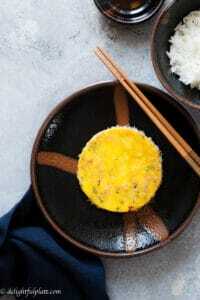 Vietnamese Egg Meatloaf (Cha Trung) is a delicious Southern dish which is easy and quick to make. The meat and crab mixture is moist and flavorful while the mushrooms add crunchiness to the texture. 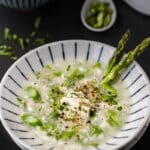 You can enjoy it as either a side dish or main dish. 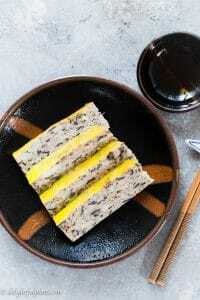 Egg Meatloaf is a popular dish in the South of Vietnam. People in the South often serve a slice or wedge of egg meatloaf with grilled pork chop and rice. More restaurants in the North started serving this dish when I was working in Vietnam 5 years ago. This meatloaf is soft and moist with some crunchiness from the wood-ear mushroom. Fish sauce gives the dish the signature savory taste of Vietnamese cuisine. There’s also plenty of natural sweetness from pork and crab meat. In the photo: dried wood-ear mushrooms (dehydrated), dried shiitake mushrooms (dehydrated), cellophane noodles (soaked), scallions and shallots. The main ingredients are ground pork, crab meat, eggs, dried wood-ear mushroom, cellophane noodles, fish sauce and aromatics. I like adding dried shiitake mushroom to enhance the flavor. The combination of these ingredients creates a meatloaf blend which will cook beautifully into a flavorful loaf with great texture. It’s moist and tender with enough crunchiness to make it more exciting. 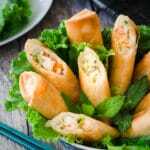 You will come across the mixture of ground pork with dried mushrooms in many traditional Vietnamese dishes, such as the traditional fried spring rolls. I recommend using dungeness crab meat if you can find it. 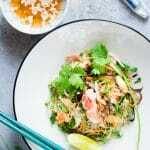 Its flavor and texture are the best for most Vietnamese dishes that call for crab meat, such as in this Crab Cellophane Noodles Stir-Fry (Mien Xao Cua) dish. However, if it’s not available where you are, it’s fine to use other types such as snow crab, blue crab, or refrigerated canned fresh crab meat. The dish will still be delicious. The preparation is easy. Dried wood-ear mushroom and dried shiitake mushroom are rehydrated and finely chopped. Cellophane noodles need to be soaked in water for 10 minutes and then cut into 1-2” long pieces. You then throw all ingredients in a bowl and mix well to combine. My favorite method to cook Vietnamese egg meatloaf is in the oven even though the traditional way is steaming. You can transfer the meatloaf mixture to a square pan or round cake pan, put it in the oven and bake for about 20 minutes. After that, you take the pan out of the oven and brush the top of the meatloaf with beaten egg yolks, put back in the oven to cook for 5 minutes to create the bright yellow top for the meatloaf. You should leave the oven door open when cooking the egg yolk glaze in order for the top to turn out smooth and beautiful. From my experience, it’s better to use a square pan or cake pan rather than a meatloaf pan. When I used the meatloaf pan, the meatloaf came out soggy and greasy. 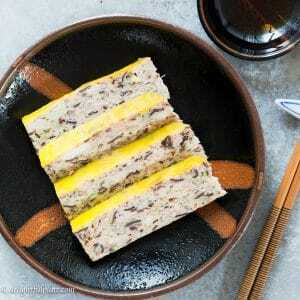 Vietnamese Egg Meatloaf (Cha Trung) is a delicious dish which is easy and quick to make. 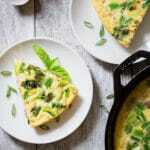 You can enjoy it as either a side dish or main dish. Soak cellophane noodles in cold water for 10 minutes. After 10 minutes, remove from water, wash, drain and cut into 1 - 2'' long pieces. Soak wood-ear mushroom and shiitake mushroom in hot water for 5 - 7 minutes or until fully rehydrated and soft. After that, remove from water, wash, drain and squeeze out excess water. Remove stems and put into the bowl of a food chopper/food processor. Add shallot and garlic to the food chopper and process everything into fine pieces. Separate the yolks and the whites of 3 eggs. Beat and refrigerate the egg yolks. 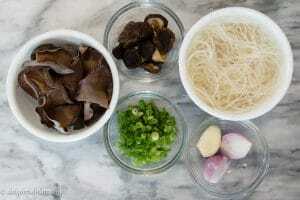 Add all ingredients to a mixing bowl: ground pork, crab meat, cellophane noodles, wood-ear mushroom and shiitake mushroom mixture, scallion, fish sauce, salt, pepper, 1 whole egg and 3 egg whites. Mix well into a pale and sticky mixture. Grease a square pan or round cake pan with olive oil (I use a 9'' round cake pan). Transfer the meatloaf mixture to the pan. Press to evenly distribute the mixture and smooth the surface. Bake the meatloaf in the oven for 18 minutes. After 18 minutes, remove it from the oven and brush the beaten egg yolk all over the top of the meatloaf. Return it to the oven, bake with the oven door open for 5-7 minutes until everything is fully cooked. Take the meatloaf out of the oven. Let it rest for 3-5 minutes and then cut into slices or wedges and serve. The diameter of my cake pan is 9'' and my meatloaf is about 1-1.5'' thick. If yours is thicker, you may need to adjust cooking time accordingly.